The two units are designed and function in different detailed ways. However they are both based on the use of a wax capsule as used extensively in vehicle water cooling system thermostats. 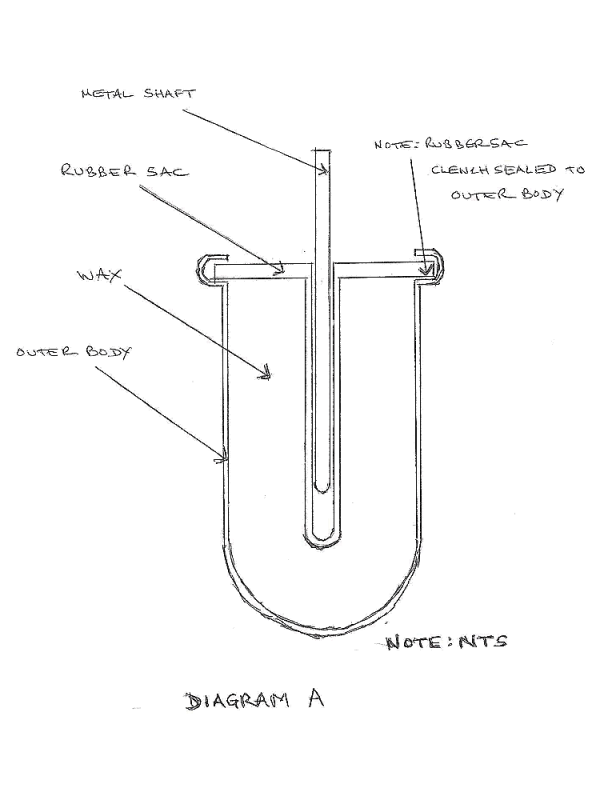 A diagram of a wax capsule is shown in Diagram A. The wax capsule is contained within a copper alloy outer housing. There is then a rubber sac sealed to the top of the housing. The sac is formed to house a small diameter metal shaft. The space between the housing and the rubber sac is filled with wax. The type of wax is chosen to have a phase change from solid to liquid at or near to the desired control temperature of the device. At the temperature of phase change from solid to liquid the wax expands and pushes the metal shaft in a direction out of the capsule. This movement is used to actuate a valve system to control and direct the flow of the oil. The forces involved with a change of phase are significant. Think of water undergoing a phase change from liquid to solid at 32ºF and the forces involved bursting open a copper water pipe. Modern wax capsules have a mixture of several different waxes with slightly different phase change temperatures so that the movement of the metal shaft is progressive over a small range of temperatures rather than being an abrupt on/off at one temperature. Modern wax capsules also have copper dust mixed in with the wax to increase the overall thermal conductivity of the wax and thus reduce the response time to changes of temperature.